The PA3 Community Service Committee encourages alums to get in the holiday spirit by participating in Princeton's "A Cappella Jam and Toy Drive," "Holiday Hoops and Food Drive," and other university initiatives on campus and around town. Check the links for dates and details. Friday, December 4, from 6:00-8:00 pm at the West Windsor Seminary pool. This event is free and open to the public. Saturday, December 5, from 4:00-6:00 pm at the YMCA pool in Princeton. This event is for Y members. There will be swimming and non-swimming volunteer opportunities on both evenings. An aquatic Santa and a couple of reindeer are needed to swim in the pool with the kids. Costumes will be provided; reindeer will wear ears and a red nose with their bathing suits, and Santa has a full red suit to swim in. Volunteers are also needed to help with arts and crafts, take pictures, and serve up some treats. If you’d like to volunteer, or for more information, please contact Denise Soto at dsoto@princetonymca.org or 609-497-9622 x209, and identify yourself as a PA3 volunteer. Curious about progress made at Isles' Johnston Avenue building since we were there last spring? Here's an opportunity for past volunteers to see how much has changed, and for new volunteers to see what past PA3 work teams have been so excited about. We will have a final volunteer opportunity at the site on Saturday, December 12, from 9:00-1:00. Work will include both outdoor brush removal and interior clean-up. The 6.5 acre site - a former textile mill being converted by Isles into a mixed-use, "green" village - is located at One North Johnston Ave, Trenton NJ 08609, about a 12-minute drive from Princeton's campus. Everyone who comes to help out on the 12th will receive an exclusive, tasteful-orange, PA3-logo-embellished, volunteer-appreciation baseball cap. (If you already have one, please wear it.) 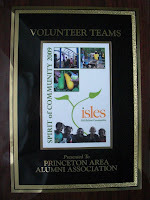 In the interest of Princeton community spirit and good photo ops, volunteers are encouraged to wear orange. If you would like to participate, or have any questions, please email Arlen Hastings at hastings@ias.edu. Family members, including children ages 10 and up, are welcome. 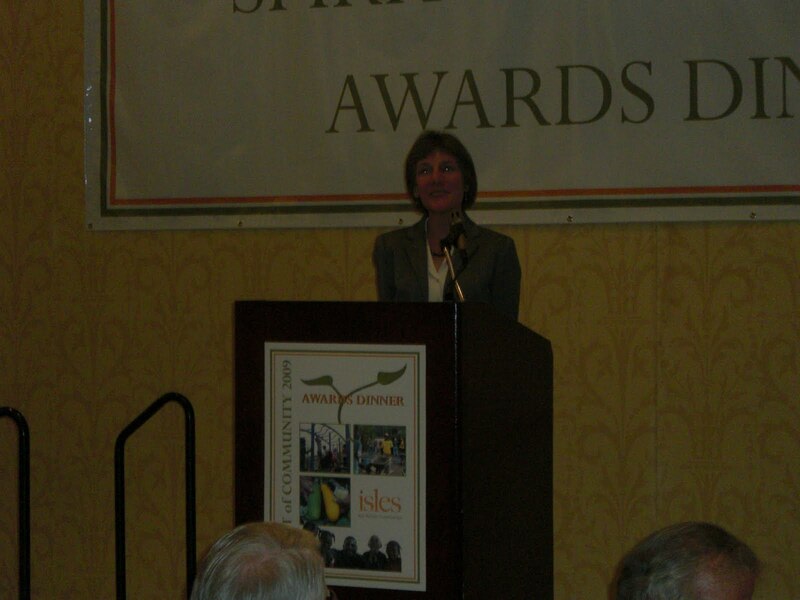 PA3 was one of four volunteer teams honored by Isles, Inc., at its annual Spirit of Community awards dinner, held at the Trenton Marriott on November 19. 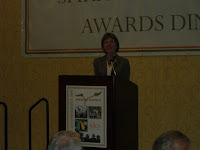 Community Service chair Arlen Hastings accepted the award on behalf of the association. PA3 volunteers were recognized for their participation in four day-long construction events at Isles’ Johnston Avenue property (described in earlier posts). 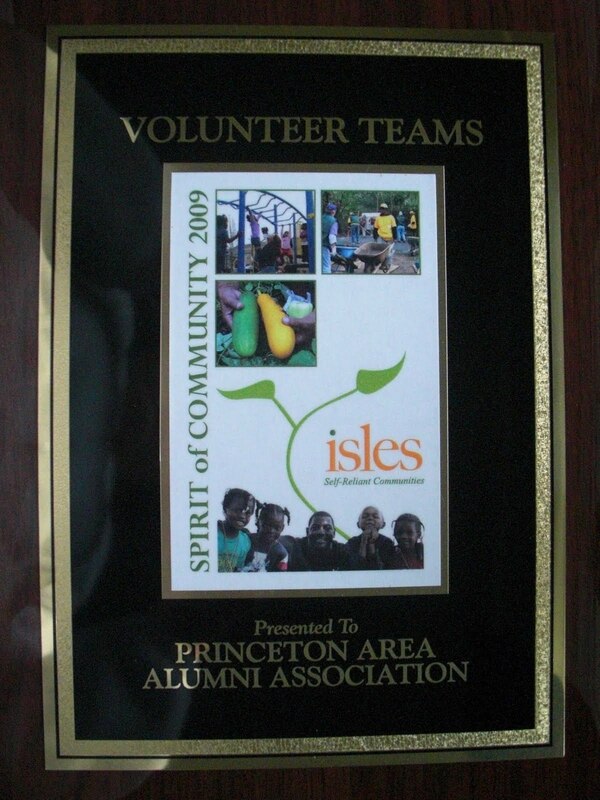 The next PA3/Isles volunteer day is tentatively scheduled for Saturday, December 12; details to follow. Graduate alumni are encouraged to attend the next APGA (Association of Princeton Graduate Alumni) mixer. Mingle and converse with current graduate students. Click here to view the invitation.